When you need to cut compound miters a miter saw is usually your best bet. But the miter saw does have its size limitations and usually maxes out at a 4x4" capacity. 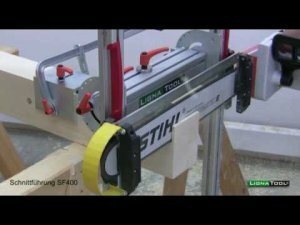 When you need to make bigger cuts you need to look to other tools, and this chainsaw timber cutting guide from Ligna Tool, surprisingly, looks like it can match a miter saw for accuracy. 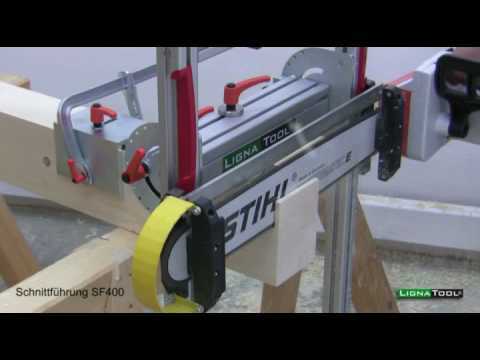 What is really impressive about the Ligna Tool Miter Chain Saw guide is its simplicity. The chain saw is guided by two rails that pivot to allow for miter cuts, and it even has a laser guide to show where your cut will be. There are not many moving parts to it yet it has the ability to cut compound miters all the way up to 75-degrees and has a timber cutting capacity up to 14x16".